Photographed at Hedgepeth Hills, Maricopa Co., Arizona. Feb 2, 2008. This image is available at full resolution at the Wikimedia Project. The flowers of Sahara Mustard are disposed on tall spikes and are very pale yellow. Long, coarse siliques contain many seeds. 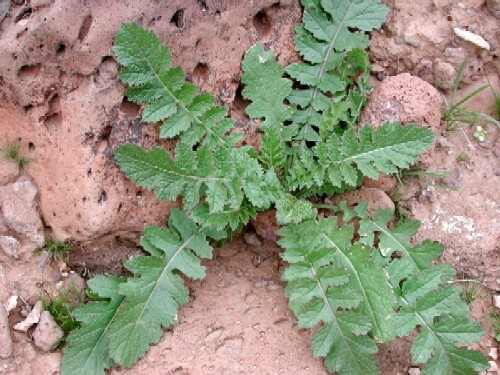 ANNUAL : Robust weed of mostly disturbed ground but increasingly invading pristine Sonoran Desert habitat. Begins vegetative growth early spring or late winter. LEAVES: Leaves are pinnately dissected and are beset with stiff trichomes. Before flowering begins the bulk of the leaves are clustered around base at soil level. 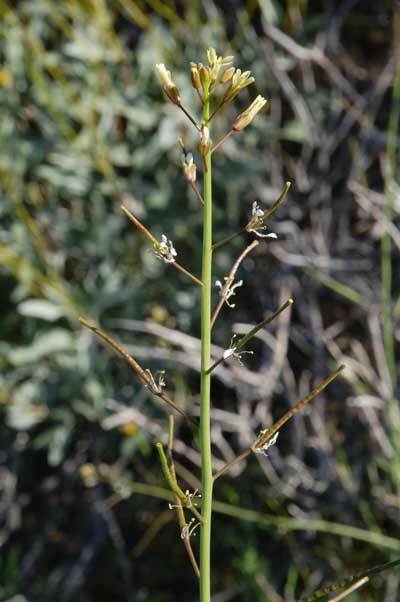 Leaves on the flowering stalk are much reduced in size. RANGE: Frequent to abundant throughout the Sonoran Desert in Arizona and Mexico at roadsides, near agriculture and increasingly on desert flats, rocky bajadas and along washes. There are many native mustards in these habitats that could be pushed out by this invasive weed. FRUIT: Mustard pods are borne in great abundance on the drying inflorescence panicle. One weed can produce thousands of seeds. FLOWERS: Flowers are pale yellow with the usual mustard formula: 4 + 2 stamens, 4 petals and 4 sepals. Flowers Feb. to April. UNARMED. Even so, the stiff hairs on the leaves and stems make them unpleasant to handle.